One of the most painful things that can happen to a parent is when an adult child treats you with distain or contempt or refuses to have any contact with you at all. 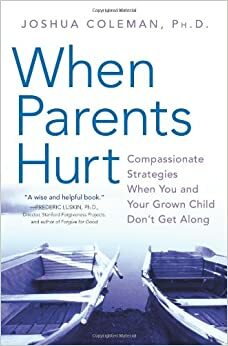 When Parents Hurt is a wonderful book full of how to strategies to help you when you and your grown child don’t get along. The author, Joshua Coleman, is a California-based psychologist who works with parents, families and couples. He, like many others, faced issues parenting adult children when, for several years his young adult daughter had little contact. He calls those years the most painful and confusing years of his life. Coleman takes a non-blaming stance and yet provides insight about why difficult relationships develop. He provides strategies for parents to accept the relationship and find peace even if it cannot be healed, as well as strategies to regain a positive relationship with the child, if that is possible. Children may shame or reject a depressed, anxious or unfulfilled parent as a way to decrease their feelings of empathy for them. Sometimes children find the only way they can achieve a healthy distance from their parents is through rejections or by moving away. children who fail to launch. This book was published in 2007 but it is still very relevant. It is an excellent resource for parents who are suffering from poor or no relationships with their adult children and for those who simply want to learn techniques to help them better parent their adult children. Coleman has a current website dedicated to this topic. He offers webinars for a reasonable amount and a forum for parents to discuss their poor relationships problems. He does not respond to posted comments and in some cases they appear as rants. However they may be helpful for some parents to read and thus understand there are others who face similar problems. Have you read this book? What did you think? Please don’t hesitate to leave a comment in the Reply Box below.